We are preparing for another snowstorm. Really. May 1st. They are predicting around 6 inches. It should melt pretty fast as it was 80 degrees yesterday. Crazy weather, but it’s always interesting! I have a short story I want to record into my blog. But first – I’m actually working on Blurb.com to turn my blog into a book. I like the idea of having a hard copy to keep just in case something ever happened to my blog. So far I am working on 2012 and it’s going to be at least 135 pages alone. Blurb is awesome for this. It imports the blog – pictures and all. They call it “slurping” which I think is kinda hilarious. I still have to go through it page by page though and do some formatting. I am thoroughly enjoying it because I get to read back over my blog. I read about things that I had already almost forgotten about. So anyway, a couple of weeks ago we flew to Seattle. We got to the Denver airport and started going through the security process. That’s really an experience these days. I haven’t flown much in the last several years. In March, I actually flew for the first time since Davey was born. There’s lots of putting shoes and other things into totes. So they put my suitcase through the x-ray thing. As it passed through, I heard one of the security people say “Bag Check”. It did not even occur to me though that they would be referring to my bag, but over came a lady to check the bag out. Sure enough they were referring to my bag. She said that she was going to have to inspect it. I said sure, and I told her that the only things in the bag were my clothes and hairdryer. She told me that once she started going through my bag I should not touch or even approach it. Then she went through it all very thoroughly. She had a piece of cloth that she used to wipe around the inside – looking for explosives I guess? I thought she was done, but then she unzipped the outer compartment on the front of the suitcase. From this compartment she pulled out not one, not two, but three pocketknives. I felt like my jaw hit the floor when I observed this. I was just a little embarrassed. Three knives? Why would I have three knives? Apparently David had stowed the knives there when we moved at some point. I hadn’t used that bag in a long time. They confiscated a pocketknife from David the last time he was at the airport. We are now down four knives. The guard was very nice about the whole thing. I kept apologizing. That’s my story. I guess I won’t forget it, but I wanted to get it down in my blog anyway! How about a picture to end with? 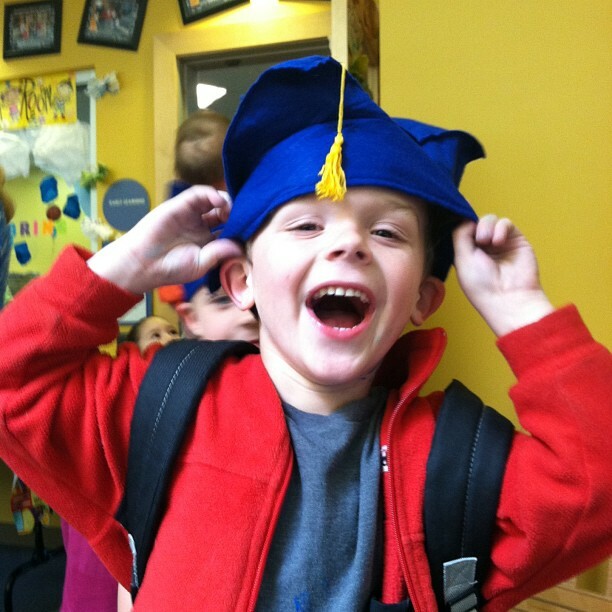 Davey is graduating from preschool in two weeks. Today they sent the kids home with their graduation caps which they are supposed to decorate. I’m not sure how to decorate a boy’s hat; I’m going to be looking to pinterest for guidance! This entry was posted in Family and tagged blurb, blurb blog slurp by cpeezers. Bookmark the permalink. They were actually lock-blade knives.